Having practiced Chinese Medicine for 13 years, I always had the goal to participate in an advanced training program in China. 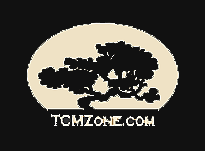 In May 2016, I was able to realize this goal when I embarked on a trip to China organized by TCMzone and Shanghai TCM University for advanced herbal training with seasoned practitioners of Traditional Chinese Medicine. Since my practice consists primarily of prescribing customized herbal formulas for patients with various conditions, this was the perfect training for me. The trip began in Beijing where we did some sight-seeing, and I was able to immerse myself in the culture and history of China, touring the Great Wall; the Forbidden City known as the imperial palace from the Ming Dynasty (see picture with TCMzone’s Jennifer Knapp, she has a great article too); Tiananmen Square at the center square of Beijing known as “Gate of Heavenly Peace”; The Temple of Heaven known as the Taoist temple; and so much more. After our short stay in Beijing we traveled to Shanghai on the bullet train where I could see first hand the countryside of China. 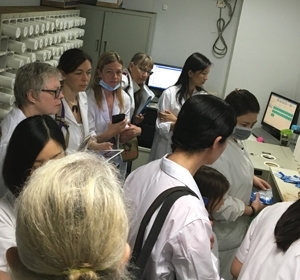 Once we arrived in Shanghai, it was mostly all business at the Longhua hospital doing inpatient and outpatient rounds with the doctors in the hospital. In the morning, we would see approximately 30 cases in the outpatient clinic with an interpreter describing the case, the diagnosis and the herbal prescription. People would line up outside the door to see the physician. Each patient would have a copy of their chart that they would bring to the doctor to review. On occasion a patient would walk in on another in the middle of their consult and they would be asked to leave. There clearly is not any HIPPA compliance being enforced in this hospital environment. The outpatient acupuncture clinic within the hospital was just as busy. There were a many different acupuncture clinics all with a small amount of space that consisted of a divider to make 2-3 different rooms on each side with a curtain and approximately 4 chairs out in the open so they could see approximately 10-12 patients at once. Some rooms were even smaller than this. There would be about 2 doctors along with some interns to assist with treatment. There were many cases of Bells Palsy in China, so this was a condition that we witnessed being treated often. Treatments would include acupuncture, electrical stimulation, cupping, facial cupping for the Bell’s Palsy and Moxibustion. The inpatient experience later in the day was a much more in depth study, examining 3-4 patients in much greater detail, see picture on the right shows I was checking a patient’s pulse . 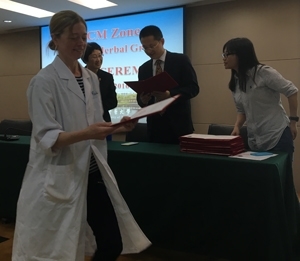 The team discussed the patient’s history, symptoms, and a detailed plan of short term and long-term treatment including herbal medicine and lifestyle recommendations. In Cardiology, we would see patients hooked up to an IV drip of Dan Shen instead of a western medication for their heart. Huang Lian Wen Dan Tang was also a popular formula given to some of the Cardiac patients. In Traumatology, pain patients had an area where they had steam beds made for an herbal steam for their pain. The patient would lie in this metal bed with a grate plate for the steam to come through the body. The bottom of the bed would have a concoction of herbs. The left over dregs of the herbal concoctions were wrapped in towels to put locally. One patient had the dregs wrapped in a towel on her neck to help treat her neck pain. Another form of external pain management were herbal patches placed on the patient’s skin that were used for electrical stimulation with a TDP lamp every other day for 20 minutes for approximately 10 sessions. In addition to taking the herbs topically, patients would also have a prescribed herbal tea to take internally. In the basement of the hospital is where they kept all the herbal supply that included the raw herbs, machines to decoct the raw herbs into liquid to make packets of tea, along with granules that are dispensed in the hospital pharmacies. There were bags and bags of raw herbs stacked in the supply room. Definitely a different look than what we might find in storage room of a western medicine hospital. Afternoons also included lectures given by MD’s and professors on various topics such as cardiology, gastroenterology, immunology, and much more. Herbal prescriptions were presented for specific energetic patterns along with modifications of a formula depending on the case. During my time in China, I had another equally valuable personal experience. I had been taking Western medications for a flu like virus, and as an asthmatic, I had been advised by my pulmonologist to continue taking steroid inhalers while abroad due to the high pollution levels in China. Initially, I was hesitant to keep taking them for the prescribed time, but as an asthmatic, you fear not being able to breathe. After about a week in China, I developed an increased appetite, dizziness, weight loss, anxiety and nausea. As the days progressed, my symptoms worsened resulting in jitteriness and shakiness in my hands. Dr. Wen accompanied me to the ER in the Longhua hospital to be evaluated. The ER doctor asked me some questions with Dr. Wen translating for me. After he completed his examination, he advised me to stop taking all my western medications. He sent my herbal prescription electronically to the pharmacy. The herbal prescription was a modified version of Huang Lian Wen Dan Tang. Going to the hospital pharmacy was an experience in itself. There are three different floors for the pharmacy with each dispensing a different type of herbal prescription and medication. One is for granules, a second is for sealed bags of liquid tea, a third for pill forms of an herbal formula, and lastly, a separate wing for the western medicine dispensary. Each patient receives a number to pick up prescriptions at the many windows they have on each floor to dispense herbal prescriptions. After receiving my prescription of granules and stopping my western medications, I felt better each day. My valuable lesson in China was, “Always question if you really need a western drug for long periods of time.” I learned first hand that long-term use of western medications can have consequences for your health. The Chinese primarily use herbs, occasionally prescribe western medicine for short periods of time, and then return to an herbal regimen as long as needed. 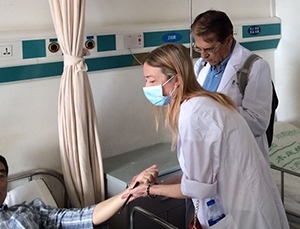 The experience I had in China was the opportunity of a lifetime, and I will always be grateful to have been able to experience the Chinese healthcare system as a patient. It was unfortunate that I had to struggle with my health on that wonderful trip but what better way to experience their healthcare system than going through their system as a patient. And I should mention that my ER visit, and herbal prescription cost a total of $130 US dollars. Now that is affordable health care! 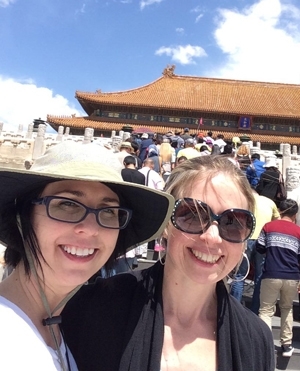 What a great read Sherri, it’s so exciting to hear your personal experience in China. Even being on this same trip with you, I learned new things from reading your perspective. I’m more than sufficiently inspired to do it all over again! Let’s go! Thanks for sharing. It was my pleasure to share my experience. I would love to go again and be immersed in the culture and their healthcare system!! It is an amazing opportunity!!! And if you two lovely ladies go again, I might have to join you. Sherri, you wrote yet another excellent article!